Heloise Blais, our new exchange student from France met the Club for the first time on Tues. Her first official act was to present Club President Bill French with her home Club's banner. We're looking forward to a great year with Heloise. PS ... Our French will probably improve as well. We were pleased to have District Governor Reg Madison and his wife Lorreta join us for our meeting this week. 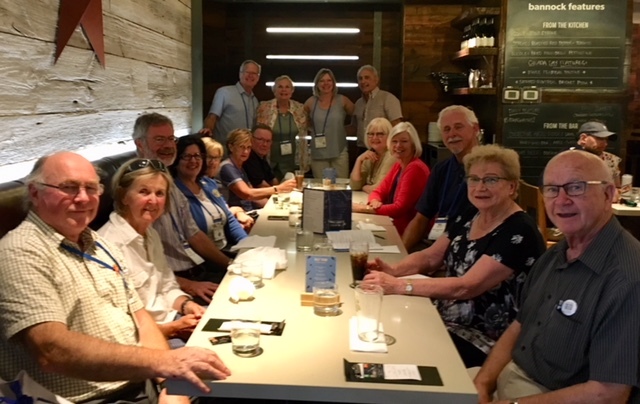 Reg gave a great overview of District 7090 key priorities and encouraged all Rotarians to 'Make a Difference" both in our local communities and around the world. Pictured is Past Assistant Governor and NOTL Rotary Member Ian McEwan thanking DG Reg. I don't think we've ever seen the guys look this happy. Thank you to Monica and Yoko from Ospa at the Oban Inn for helping to make this such a special event. The Rotary Club of Niagara-on-the-Lake is providing assistance to Civil Air Rescue Emergency Services (CARES) Niagara to keep their headquarters at Niagara District Airport dry. 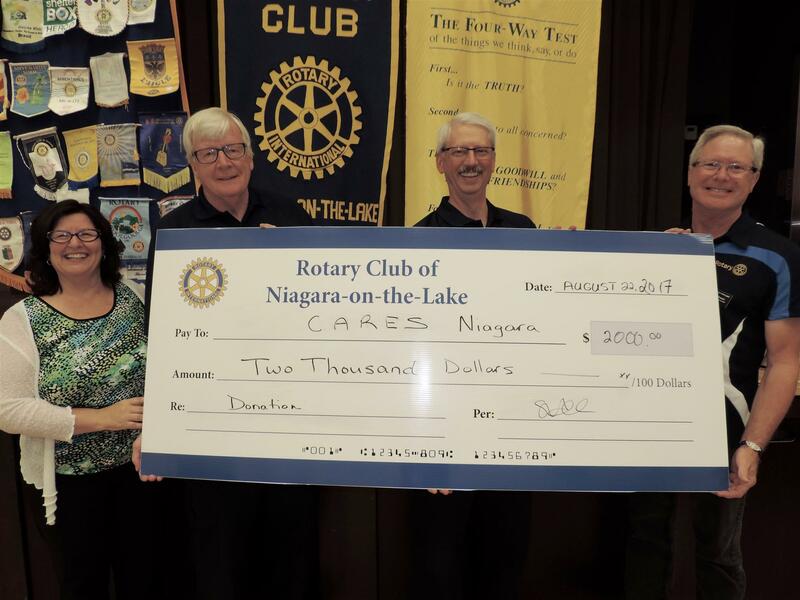 Rotary President Bill French and Club member Nadja Lepere presented CARES volunteers, Terry Nord and Randy Klaassen with a cheque for $2,000. The donation will go toward replacing the roof shingles on CARES’ 30-year-old building at the airport, which began to leak last fall. Providing aviation search and rescue resources for south central Ontario, CARES Niagara owns and is financially responsible for its training facility and operation of a mobile command vehicle and a Cessna 182 aircraft. In addition, a member owns a Cessna 337 Skymaster. CARES members are trained to professional standards, and evaluated every two years by members of the Canadian Forces. CARES Niagara is a registered charity, and member of the national Civil Air Search And Rescue Association (CASARA) whose members are all volunteers, serving in a variety of roles, both on the ground and in the air. For more information, to volunteer or donate to CARES, see the web site Ontario.casara.ca, or leave a message at 905-684-0408. 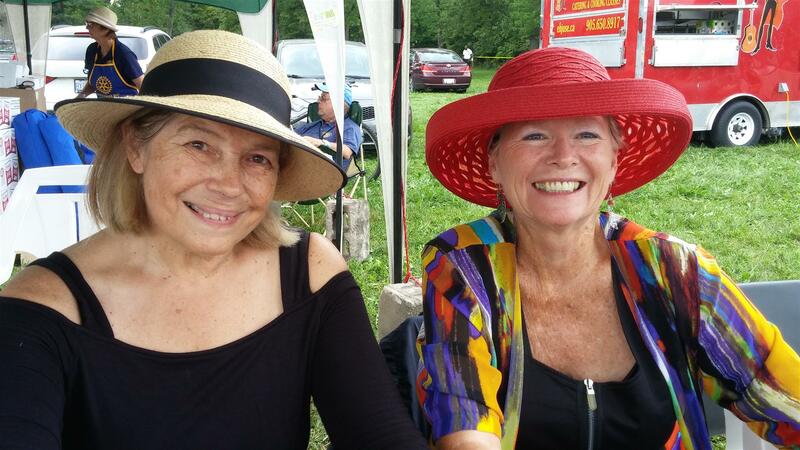 Sharon Frayne, local author and member of the Niagara Writer’s Circle brought to life the important contributions of the Johnson family and their connection to NOTL. Chief ’Smoke’ Johnson, Chief George Johnson and the poet Pauline Johnson, Mohawk members of the Six Nations helped shape Canadian history and culture. Stories by the Writer’s Circle are featured weekly in the Niagara Advance to celebrate Canada 150. The Rotary Club of NOTL presented the proceeds of the High Tea Spring Fashion Show to RAFT. Presenting the cheque is Sandra Nass and Jeannie Manning (Fashion Show Committee), Nadja Lepere (2016-2017 Chair of the Local Service Committee) and Bella Grace Boutiques. The RAFT offers support and social services, programs and resources for youth throughout the Niagara Region. With special thanks to Bella Grace Boutiques for making this fundraising event possible. President Bill French bids Bill Francombe adieu as he moves back to Toronto. Dr Bill was a long standing, much loved Member of our Club. His contributions and great sense of humour will be dearly missed. All the best Bill and Patricia. Marion Boon, Executive Director of the Canadian Risk and Hazards Network gave an information presentation on disaster preparedness and the roles the various levels of government play in major disasters. Jim Reynolds of the Niagara on the Lake Syrian Refugee Project updates our Club on the progress of the Bakhit family. A dedicated group of Rotarians and community volunteers led by Betty Disero and Sandra Nass collected, cleaned, bagged and sold the Town's "gently used" tulip bulbs. 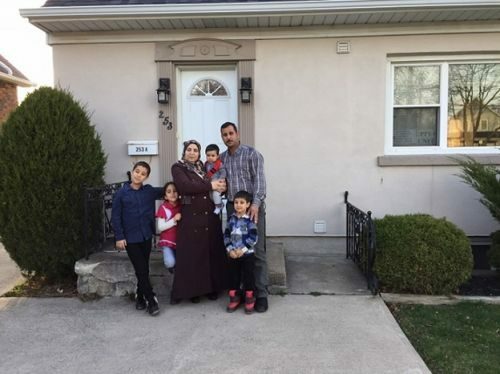 The sale raised $2,000 which was donated to the Town to be used to help reforest NOTL with naturalized tree species. Thanks to all for all your hard work. John Mather was recently recognized as the NOTL Volunteer of the Week by Communities in Bloom. John was a 2016 recipient of the NOTL Rotary Club Paul Harris Award and is the Club's President Elect for 2018-2019. He's also a great guy who can be counted on to get things done. We couldn't think of a more deserving person for this recognition. Congratulations to Ward Simpson on his recent appointment to Chairman of Red Roof Retreat. We know you'll do a great job, Wardie. MPP Wayne Gates gave an entertaining overview of his political track record (we're going to call him "Rocky" from now on) and an impassioned account of his focus and priorities at Queens Park. Carl Bodimeade, Senior Vice President of Hatch Engineering presented an overview of the history of power generation in Niagara. It was a fascinating and somewhat different historical perspective on our community. Carl is pictured here with President Ursula Kucharski receiving a donation to the eradication of polio in his name. Rotarians Jeannie Manning, Doug Holroyd and Bill Francombe receive Paul Harris medals recognizing their contributions to the Rotary Foundation. 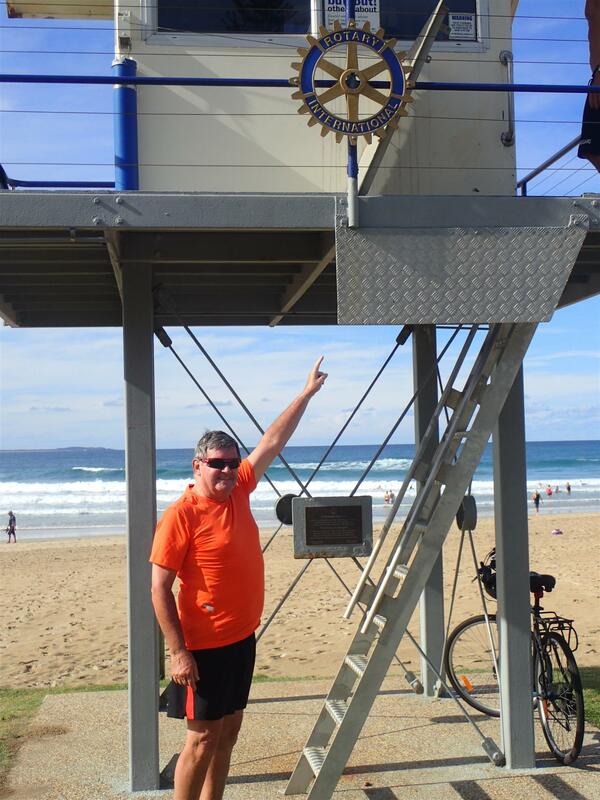 The Rotary Foundation is a leading, highly regarded international charity that transforms your gifts into service projects that change lives both close to home and around the world. During the past 100 years, the Foundation has spent $3 billion on life-changing, sustainable projects. President Ursula and Community Committee Chair Nadja Lepere present Lord Mayo Pat Darte and Library CEO Cathy Simpson with a $5,000 donation to the Library Renovation Fund. God again decided to sprinkle on NOTL for a few minutes on Saturday morning then give over the rest of the day to the Sun and Heat Goddess. Perfect day for Polo and Gourmet Burgers. A huge thank you to Patrick and his team, and to all the volunteers. A fabulous Job done. Thank you Don, for the great pictures. Pictures tell better than words. Getting to Know Jackie, McNally. Sad... a farewell To Ana we will miss her. A great Japanese presentation from this wonderful young man. It was just great. RI , PH award pins given. A week in the life of Ana. FOR THOSE OF YOU WHO WERE NOT PRESENT AT THIS WEEK'S MEETING WHEN I SHOWED SOME OF THESE PICTURES. I AM POSTING THESE PICTURES FROM JEANNIE AND WARDIE IN THE BULLETIN. HOWEVER, I CAN'T RESIST THIS ONE SENT TO ME BY CLIFF. 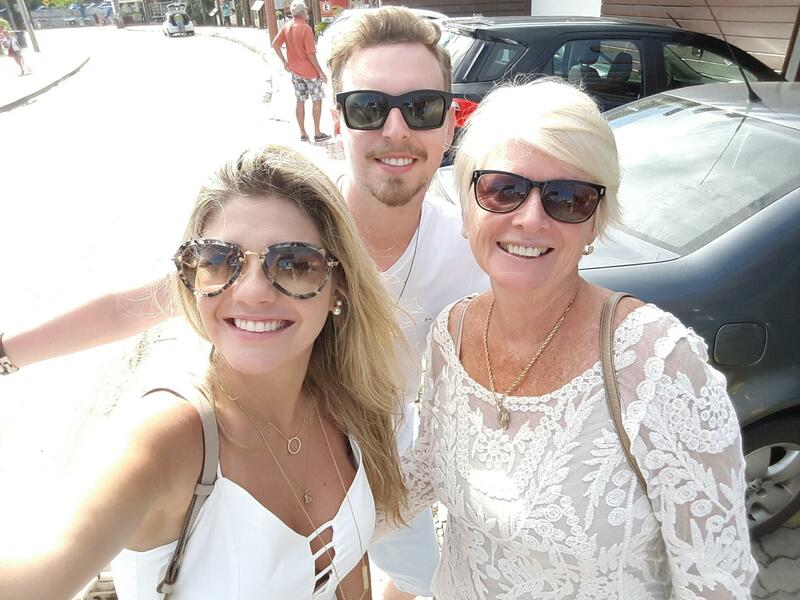 Jeannie is still on vacation in Brazil and had both of them staying with her and Lee last week in Florionapolis. Both of them are now lawyers. Aren't they lovely young people. 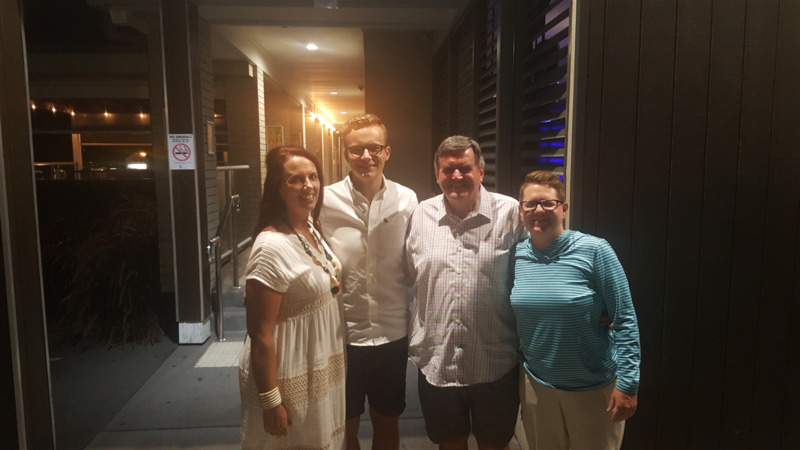 After his Rotary makeup meeting in Port McQuarie in NSW where the meeting consisted of body surfing and wine , Lisa and him then met with Jordan and his mum Lyndal. It's a tough life. Ok guys, That's quite enough , when are you coming back????? This week we will have a presentation from Ron Clavier, artist at The Pumphouse. The following week ( March 29th ) is the 5th Tuesday at The Exchange on Queen Street , for beer tastings and beer related food.